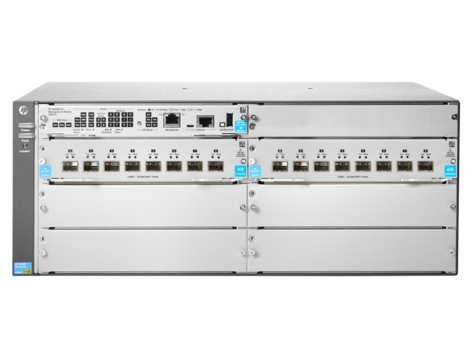 The HP 5400R zl2 Switch Series is an industry leading mobile campus access solution with HP Smart Rate multi-gigabit ports for high speed connectivity and bandwidth for next wave 802.11ac devices. It brings enterprise-class resiliency and innovative flexibility and scalability to converged campus networks. Robust virtualization with HP AllianceOne solutions, hitless failover, QoS and security with full L3 features and flexible connectivity including 40 Gigabit Ethernet ports and full PoE+, the 5400R requires no add-on software licensing and is SDN ready with OpenFlow support. The HP 5400R zl2 Switch Series is an industry leading mobile campus access solution with HP Smart Rate multi-gigabit ports for high speed connectivity for next wave 802.11ac devices. It brings enterprise-class resiliency and true flexibility, security and scalability to converged campus networks. Based on the 6th generation HP Networking ASIC, the 5400R has a high-speed, high-capacity architecture with 2 Tbps crossbar switching fabric with low 2.1mu latency and unprecedented programmability and leading edge SDN applications. Flexible connectivity options with 6 or 12 slot compact chassis, support for line rate 40 GbE, up to 96 line rate 10GbE ports (SFP+ and 10GBASE-T), 1GbE and up to 288 ports of PoE+ with internal power supplies. SDN ready with OpenFlow 1.3 supporting future enhancements for your network. License free software with advanced Layer 2 and 3 feature set including IPv6, IPv4 BGP, policy based routing, OSPF and robust QoS. The HP 5400R zl2 Switch Series utilizing the 6th generation HP Networking ASIC delivers wire-speed classification and policy enforcement. This hardware-based control of access and traffic allows protection, detection and response to network threats with no network performance degradation. Nonstop switching and routing for improved support of applications such as unified communications and enhanced L3 high availability. Redundant management and power enhances system availability and continuity of operations. Hot-swappable modules and optional redundant power supply provides uninterrupted power and allows swapping of modules with no impact on the network availability. Powerful virtualization with versatile HP AllianceOne service modules. The HP 5400R zl2 Switch Series includes a robust set of security and quality of services features to build a network that meets ever-changing corporate policies and compliances. Flexible authentication options include 802.1X, MAC and Web Authentication, delivering greater security and policy-driven application authentication. Industry standard MACSec provides link-level encryption security between two points using copper or fiber links (available on select modules only). Powerful multilevel-access security controls, such as varying security management login, RADIUS/TACACS+, and SSH for safe control change management access. The HP 5400R zl2 Switch Series can be seamlessly managed with HP Intelligent Management Center (IMC) Software to provide end-to-end network transparency with consistent network experience through comprehensive configuration, compliance and policy management. Limited Lifetime Warranty 2.0 includes 3 years 24x7 phone support.